Dodgeball; You Are So Popular. I'm glad we're friends. Knowing you makes me feel more important. At one point during our junior high track at last weekend's conference, we broke up into round table discussion groups. We offered for different round table topics and each participant could chose two of the four. I was hosting the "misc. junior high issues" group. The idea behind this discussion group was simply to power our way through as many junior high topics as possible....topics that hadn't yet been covered in the 8-hour training track. The first group came through and we put about a dozen topics on the board and had some really good discussion. When the second group came through, I assumed most of the topics they would suggest would be repeats from the first group. Much to my surprise, the list of topics proposed by the second group was ENTIRELY different; not a single repeat topic! You are probably wondering what the topics were. So am I, because I foolishly left both flip-chart pages in the conference room. But I do know that they ranged from running games to dealing with abuse and everything in between. So, just for fun: If you were in a circle of other junior high youth workers what is one topic you would want to discuss? It took me almost two years to get to this point. It probably only took Josh Griffin two weeks. As it turns out this may be my last post. I had hoped to make it to 500 (this is number 499), but these three hours may in fact end society as we know it. The second title may possibly be history's longest! These two books come highly recommended...but not by me because I haven't read them. They were suggested to me by two junior high youth workers I recently met as we were discussing tools to put into the hands of parents. Wow, it's been hectic and really, really fun. Yesterday we started day one of a two-day middle school ministry track and haven't slowed down since. About 120 fellow middle school workers holed up together to learn a little and to laugh a lot. At large events like this one, you always expect great music, fantastic speakers, and all that good stuff. But what seems to have set my experience this year apart from so many others is the number of deep conversations I've had with people...conversations that have led me to really think about ministry and life. "Our Ministry exists to REACH non-believing students, to CONNECT them with other Christians, to challenge them to GROW in their faith, and to encourage the growing to DISCOVER their ministry and HONOR God with their lives." It's been a great weekend, but I'm ready to head home! After a crazy travel day (cancelled flights, re-booked then cancelled, then re-booked etc.) I finally arrived at about 1:30 a.m. I spent the morning with a group of about 40 large-church youth pastors from the Christian Missionary Alliance. A big part of their discussion was an interesting challenge to stay true to biblical text while being theologically creative at the same time. I really enjoyed my time with them. Had lunch with two marketing guys from Standard Publishing to discuss plans to update, revise and re-cover Controlled Chaos which I'm really excited about. Spent the afternoon with Scott Rubin (the jh pastor at Willow Creek) and about 100 junior high youth workers in a super casual "heart to heart" discussion about various issues. The highlight of the day was the first general session featuring Tony Dungy. He was amazingly humble, insightful and seemed genuinely excited to be with us. At one point in his message he mentioned that he typically takes only 2-3 days off from July through January due to the demands of being an NFL head coach. To be honest, my heart broke for him thinking about the toll that must take on personal life. Tomorrow we start our two-day middle school ministry track....should be fun. I'm sitting in the Atlanta airport after just hearing the news that my flight into Cinci. is delayed by at least two hours due to poor weather. Bummer. I am looking forward to being in the cold, snowy weather but hate that it's a travel factor. The trip did get off to a sorta interesting start in O.C. As I was waiting to board, It was announced that one of our flight attendants was retiring after FORTY YEARS of service with Delta and that the leg to Atlanta was her very last flight. She came out and asked a bunch of us to join her in a retirement photo. Totally weird, random and fun. Tomorrow morning I'm heading off to Cincinnati for the Group/SYM National Youth Ministry Conference. This is only the second year of this conference and things are looking pretty good. I'm slotted to keep myself pretty busy catching up with old friends, leading an 8 hour middle school ministry track etc. but I'm really looking forward to the weekend. Perhaps what I like best about being part of this conference is the written expectation that the speakers and trainers will make themselves available to spend significant time with people attending the event. Eating meals together, hanging out during free time, attending late night options etc. are part of the role of every speaker. This really makes the whole event feel much more like a conversation than a conference, which is nice. What I like least is being away from the family. The original plan was to take the kids out of school and make it a fun family trip (to Ohio? ), but it turns out my daughter leaves for her 8th grade Washington D.C. trip on Friday so plans had to change. I gotta admit, I wasn't convinced that we're on the front end of a recession until I saw how tough some churches have it. One of our better weekends in quite a while for lots of reasons. Our worship band was entirely student led...not even an adult on stage to help out which was really fun. Our lesson was 'Life is a like a video game' and we did some pretty creative stuff to add the atmosphere. We set part of our stage up to look like a living room and a few minutes into my message on of our volunteers came out, turned on the t.v. and started playing guitar hero. He played guitar hero on stage during my entire talk which was both distracting and really fun at the same time. The lesson was fun, we had a great video and we had a lot of our volunteer team in attendance which always makes for a strong weekend. Okay, here's the deal. We are about 6-7 months away from moving into our new Student Zone and it's time to land on an official name. years, but never intended it to be the permanent name. so we need something student friendly but not exclusive to 'students'. If you can't tell by the pictures, the building is a really cool mixture of old brick, concrete, aged wood and exposed steel. We've purposely decided not to open the naming process up to our students, volunteers etc. because we don't want to deal with all that entails. BUT I am hoping you may have a few suggestions. So....submit an idea or two and if we happen to use your name we will give you $100.00 worth of free resources from Simply Junior High. My brother just gave me a new wallet called the Jimi. It's marketed as a wallet for people who don't like wallets, which I am. It's interesting, really, and quite unique. Molded plastic, only holds a handful of cards and a few bills. I've only had it for about a week, but I really like it (other than the color my brother chose for me which is a transparent aqua color). ....I never have to worry about this! Every 6 weeks or so, I am the official overnight M.O.D. (Minister of the day). Tonight is my night. From 5:30 p.m until 8:30 a.m I am the pastor who will respond to any emergency calls placed at our church office. I'm sure many of you have similar responsibilities, so I'm really not trying to whine. But of pastoral roles we play, the role of crisis intervention is the one I'm least comfortable playing. This is only my second time on duty since we started this new rotation (believe it or not, until recently the same pastor was on call EVERY night!) and the first time around I didn't have any calls! I'm praying that the people who call our church their home will have a peaceful, crisis-free night! This weekend we kicked off what I hope will be a really fun and different series. Our 'I <3 Technology' series will use various aspects of technology as a backdrop (read object lesson) each week. We kicked it off with the internet and used it as a backdrop for a lesson on the subject of how do you know what's true, how do you 'filter' all the information you are exposed to etc. I think the idea was excellent, my creativity was high, my delivery strong, but my content was fairly week....even for an entry level junior high program. But games were fun, music was wonderful, there were tons of students in attendance and we did a great job programming the whole event around our theme. 1) Humility goes a long, long way in resolving conflict. 2) There really are two sides to every story and it's wise to recognize that. - I would really like to see an African-American or female president. What a great step forward for our country. BUT, not sure either of the present candidates is the right African-American or female candidate. I so wish Obama had more to offer than fantastic oratory skills. - I recently downloaded a few old Rush songs onto my iPod. Haven't heard them in a long time. Good stuff! - A week later, and I'm still thinking about the Super bowl. Best game I've ever seen. - I'm really excited about our fun, new series we're starting this week called 'I <3 Technology' (I heart technology). We are taking three major technological advances and using them as the backdrop for an object lesson each week. This week we are using the internet as a backdrop for a lesson on God's word as best source for truth and knowledge. We've got lots of fun stuff planned. 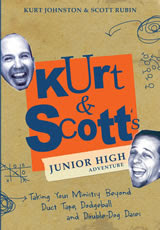 The new book "Kurt and Scott's Junior High Adventure" was just released and is available at Grouppublishing.com and Amazon.com. Simply Junior High should have it ready to ship in a day or two. The title and cover obviously set Scott and me up to take some shots from our friends so I'm putting it on this post as a pre-emptive strike. There are very few jokes and stones our friends can lob our direction that we haven't already thought of ourselves! But please, don't let the incredibly good looking images on the cover keep you from purchasing this resource. To What Do I Hold? I'm not quite ready to answer that question becuase I'm still chewing, but it's one that all of us need to ask from time to time; not so much because the answers will change (although some could...) but so that we are reminded of those things we hold dear. I recently created a little list of key areas in my life and am trying to define what 'things' in each category are things that I truly hold to; things that are non-negotiable at this point in my life for that category. It's really not as easy an exercise as you may think. I haven't read the book in it's entirety, so I thought the movie would be a good way to get to the bigger findings. It's about a year old, so I'm coming a little late to the party...but better late than never. Soul Searching; A Movie About Teenagers and God is based on the book Soul Searching by Christian Smith and Melinda Denton. I watched it last week while I was away for a couple of days and enjoyed it. I would say that there was lots of interesting, somewhat eye-opening, but not jaw-dropping information. While studies like these always have their faults, there are always plenty of nuggets of truth to be found. After watching it, I felt a sense of hope for America's youth and honored to be playing a small role in their spiritual development. Perhaps you've missed out on seeing this little documentary, too. If that's the case I think it's well worth your time. - I've spent the past two days at a friend's beach cottage catching up on some long-overdue projects. It's been productive and refreshing at the same time. - For a guilty pleasure last night I rented Shaun of the Dead. Very funny. - For the first time in my adult life, I feel tempted to not cast a vote in the presidential election. All the bickering and flip-flopping on issues is driving me nuts. I can't see it getting any better over the next 8 months. - I've been growing fond of the comedy of Demetri Martin. Of course there is the occasional coarse language and sexual humor but far, far less than most comedians. - Because I've been away, I missed the LOST premiere and am anxious to see it. I started watching in season two and never saw season one which most fans say is crucial. - Having lunch today with my life-long friend, Chris Schmaltz, who is a youth pastor in the beach community I'm staying in. I don't see him as often as I'd like so I'm looking forward to the time.